Curfew imposed, security hired to patrol Pelican Narrows, Sask. The band has also hired more than 10 security personnel who volunteered to stay behind and are stationed at the local youth centre, said ..
As of Thursday afternoon, many residents remain in Pelican Narrows, Sask., despite the community being under an evacuation order. 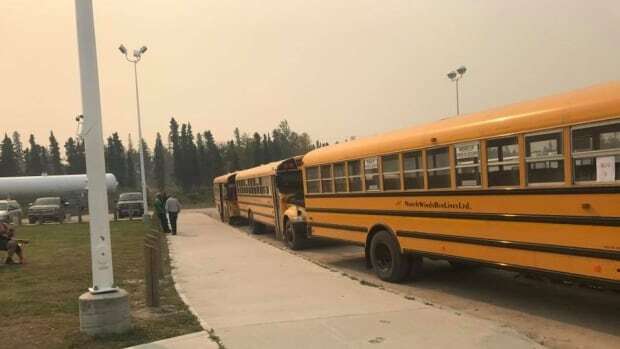 Weldon McCallum, a Pelican Narrows councillor for Peter Ballantyne Cree Nation, said the air is filled with thick smoke from a wildfire burning 10 kilometres away. He said the fire isn’t visible from the community, but he’s decided to stay behind because there are others who are refusing to leave their homes. For those in the community, air quality is a concern, McCallum said. “I get a headache, I get an irritated throat. My eyes start burning,” he said of being outdoors in the heavy smoke. He said the exact number of people staying behind is undetermined but he said more than 150 people have refused to leave. McCallum said there are 1,464 registered evacuees, but many who left the community on their own may not yet have registered. As of Thursday, McCallum said highways out of the community were still closed. When officials rule highways as passable, he said bus convoys will be sent out, escorted by police and two fire trucks. “For the members that refused to evacuate, we did set a curfew bylaw from 9 p.m. to 7 a.m,” McCallum said. He said the measure is part of an effort to give residents who left some peace of mind their home will be safe while they are away. The band has also hired more than 10 security personnel who volunteered to stay behind and are stationed at the local youth centre, said McCallum. The streets are patr olled at night and anyone caught breaking curfew will be served with a mandatory evacuation order and told to stay indoors, he added. McCallum said anyone 16 years and younger found out at night causing trouble will be arrested, detained and forced to leave on the next bus convoy.